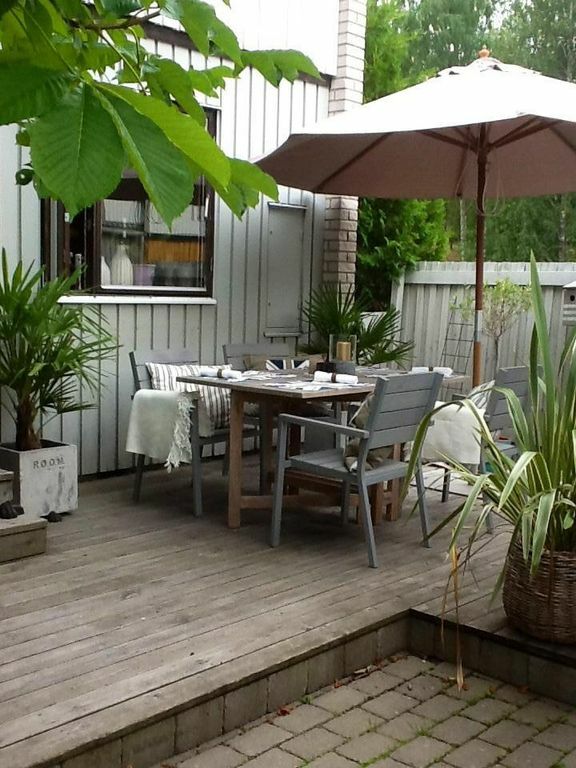 This nice and comfortible house is located 10 km from the center of Stockholm. It is also very neer Kista Sience center, about 7 km and Arlanda airport 29 km with very good transport links by bus, commuter train or subway. This house consists of four bedrooms, one master double, 2 single and 1 room with a twinbed. There is one bathroom with shower and toilet on the second floor and 1 toilet on the ground floor. Separate space for washingmaschine and dryer. On the third floor is a large room, 35 sqm, for television, console gaming, play and soo on. Fireplace, a nice kitchen and 2 charming patio, one on each side of the house, for sunbathing, breakfast, lunch, dinner, bbq with friends. There is also the possibility of a garage if needed. In the surroundings there are plenty of play areas for children, a nice narrow forrest just outside the house, 5 min walk to a beach on Lake Rösjön where there are water slides, diving board and much more for fun in the sun. In winter there is a skating rink in Edsviken, 10 min walk. There is also a large forest, nature reserve, in the area for all types of exercise such as running, walking and skiing in winter. Nearby there is also a ski lift, Väsjöbacken. There are also bicycles for use when needed. The townhouse was very well supplied and comfortable for our party of 4 adults and 3 children, 8-14. We rented a car and it was an easy drive to the subway which went directly to Stockholm. There is a small but complete market within walking distance and many nice trails to hike near a small lake. The front, outside, lounge and eating area was very nice and we used the barbecue many times. Very nice and cosy houes -recommendable!!! We were there for a week, a family with 2 children and a friend of the family. We all liked the house very well. It is tastefully decorated and there is everything you need.The kitchen is very well equipped, the bathroom is nice, there are towels for the exchange, ... and the children could use the Playstation :-) Very nice is also the seat outside. The location is good, a supermarket is nearby and the bus station is not far. You do not need a car to go to Stockholm. Margareta is very sympathetic and helpful. You can ask everything !! Thank you for a nice stay!!! Thank you Alexandra, for visiting Stockholm and My house! Pleasure to having you and hope to see you again! Informationsfolder finns tillgängligt i huset med all nödvändig information om fastigheten och området. Nyckel överlämnas vid ankomst.